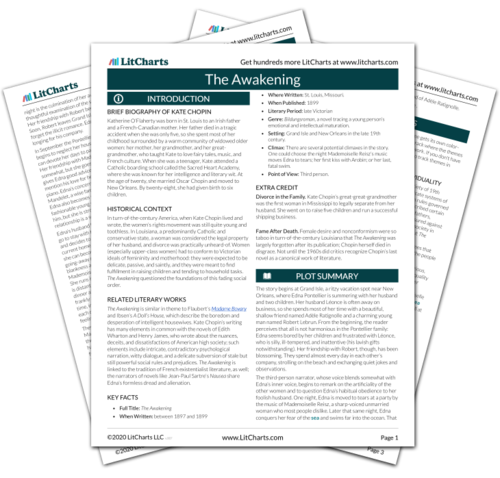 Instant downloads of all 946 LitChart PDFs (including The Awakening). 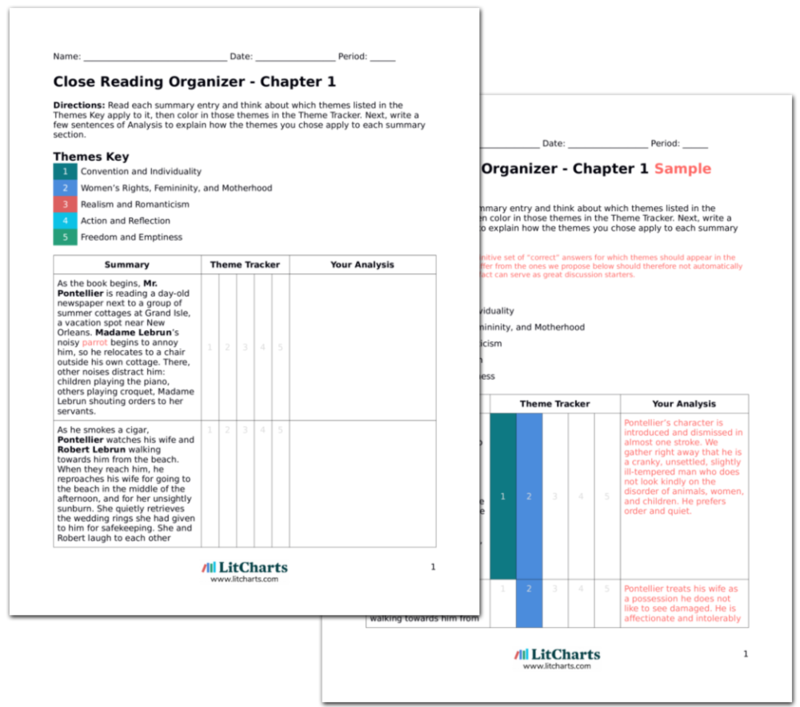 LitCharts assigns a color and icon to each theme in The Awakening, which you can use to track the themes throughout the work. When it is sunny, Edna enjoys working on her painting, which is becoming more confident. On dark days she visits friends about town or sits at home and broods. She often goes to the horse races with Alcée Arobin, a popular and somewhat notorious young man famous for seducing married women, and Mrs. Highcamp, a cold and sophisticated woman in her forties. At this stage, Edna seeks happiness and satisfaction in her art and in the company of socialites. They may not be true friends like Mademoiselle Reisz, but their pleasure-seeking habits are a pleasant distraction that focuses on individual desires. Edna tries both to remedy the emptiness she feels and to escape it. Edna knows a great deal about horse racing from her father, so her first time at the races she bets very successfully. Arobin becomes infatuated with her. Dinner with Mr. and Mrs. Highcamp and Arobin that night is a little dull; when Arobin drives her home, he insists that they go to the races again before long. She cannot sleep because of a mixture of boredom, anxiety, and excitement. She writes a frenzied letter to her husband in her mind. Edna’s social identity is changing. At the beginning of the book, people admire her for her grace and reserve; now, her friends value her high spirits and her charm. Although Edna does not much like Arobin as a person, his flirtations trouble and excite her—they remind her of her past infatuations, of the romance that is absent in her marriage. A few days later, Arobin comes to visit her alone; she can’t think of an acquaintance to chaperone them, so they spend the evening together at her house. They talk frankly, and the evening rises to a romantic pitch. When Edna impulsively touches a scar on Arobin’s hand, she becomes uncomfortable and tries to cut the evening short. She refuses Arobin when he invites her to the races or asks to come see her paintings; but her earlier excitement encourages him to confess his feelings, in a roundabout way. We are led to understand his declaration is not entirely genuine. Edna thinks of Robert and feels ashamed of her behavior. Edna’s reactions to Arobin’s persistent courtship are at times difficult to understand. If she loves Robert and feels indifferent toward Arobin, why should she feel so excited and moved by his courtship? The implication that Edna needs not only romantic, idealized love but also sensual love (of the kind Arobin offers her) was very controversial at the time the novel was published. It was quite revolutionary back then to suggest that women have sexual needs similar to men’s. Tsykynovska, Helen. "The Awakening Chapter 25." LitCharts. LitCharts LLC, 16 Sep 2013. Web. 3 Mar 2019. Tsykynovska, Helen. "The Awakening Chapter 25." LitCharts LLC, September 16, 2013. Retrieved March 3, 2019. https://www.litcharts.com/lit/the-awakening/chapter-25.